7-Day private yacht charter holiday around Nosy Be & surrounding islands. Group size: Minimum 2 guests and Maximum 8 guests. Departures: Tour departs every day subject to availability and flight schedules. Please note yacht charters are not recommended during February and March due to a risk of rain, storms and possible cyclones in the north. • 7-Day private yacht charter holiday around Nosy Be & surrounding islands. Snorkelling, Nosy Be, Tanikely marine reserve, Nosy Komba, Nosy Sakatia, Nosy Iranja, Russian Bay, Mahalina, (many other islands and locations possible, such as Lokobe Reserve, the Mitsios, Kalakajoro, etc. depending on your desire). Scuba diving at an additional cost. 6 x Breakfast, 6 x Lunch, 5 x Dinner. Supplement For English-Speaking Crew is a group cost (to be split amongst group). Rates are for the yacht "KALIFE" (French-speaking crew). Rates shown are a starting price. We have access to a fleet of yachts, each with different prices. Rates shown are subject to yacht availability. Arriving into Nosy Be, you will be welcomed and transferred to Crater Bay, where you will board the yacht before we pull anchor and set off for our first island destination. If your arrival to Nosy Be is in the evening, we would recommend a hotel pre-night in Nosy Be itself, before boarding the yacht the next morning. Overnight: On board the Catamaran - three double cabins with two bathrooms (main en-suite). Meals: Dinner prepared by chef. Because the yacht is charted privately for your group or family, the itinerary is completely flexible and tailored to your interests. There are some islands we can’t resist taking you to, such as Nosy Tanikely, Nosy Komba, Nosy Iranja, and others a little further afield which are also possible on charter – The Mitsio archipelago, the Radama’s archipelago etc. The skipper will discuss the recommended route with you upon arrival. Please see Information on “Information on Areas Visited” at bottom for more information. Meals Revised 2014: Breakfast, Lunch and Dinner prepared by chef. During breakfast, we make our way back to Nosy Be island, where you will be transferred to the airport for your flight to Antananarivo. Should your flight depart early in the morning, it may be recommendable to spend the night at a hotel in Nosy Be rather than on the yacht. This would allow for a faster transfer to the airport. Meals: Breakfast prepared by chef. Return airport transfers from Nosy Be airport to Crater Bay Marina, 6 nights accommodation on a yacht (catamaran and monohull options available) with all meals included, all activities and use of all equipment on the yacht. International and domestic flights and their airport taxes, scuba diving and the services of a Dive Master & their transport if required, soft drinks and alcoholic beverages, park entrance fees, laundry, tips, visas and travel insurance, personal items. We have a varied selection of yachts available for charter, from 36 ft. to 50 ft., accommodating a minimum of 2 people up to 8 people (dependent on the yacht chosen). Please enquire for larger group sizes. Each yacht offers double cabins (most with en-suite facilities, some with additional bathrooms), a main saloon with comfortable seating and ample seating on deck. Our chefs prepare a variety of meals including prawns, calamari, fish, beef and pastas, with an abundance of salads and fresh fruit. 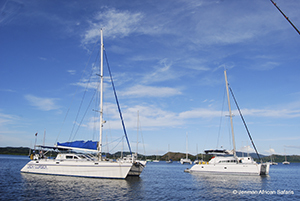 All our yachts are skippered by a fully qualified Madagascan skipper. Some of our yachts have scuba diving equipment on board. If you plan on diving during your charter, please advise this to us at the start of your enquiry, so that we can suggest and quote on the most appropriate yacht to your needs and party size. *Please note that no dive master is on board, and therefore you may only dive if you produce a valid certification, and have dived within the past year. Alternatively, with prior notice we can arrange the hire of a dive master to accompany you on your dive (additional fee). Please advise during your enquiry if you wish to fish, so that we may choose the most appropriate yacht for your needs and your group size. All our yachts are equipped with basic fishing equipment, and on request we can add more specialised equipment. We ask that you please bring your own lures, as these are largely unavailable in Madagascar. When arriving in Nosy Be on day 1 of the tour you will be picked up from the airport and will proceed with your tour. Should you arrive prior to day 1, or require accommodation in Antananarivo or Nosy Be, we can arrange pre tour accommodation for you if required, and the itinerary can be amended accordingly. Our chefs prepare a variety of meals including prawns, calamari, fish, beef and pastas, with an abundance of salads and fresh fruit. All meals are provided as per itinerary. Madagascar is an island nation in the Indian Ocean, off the eastern coast of Africa. Madagascar is the 4th largest island in the world. 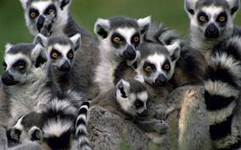 It is the home of five percent of the world's plant and animal species, 80 per cent of them unique to Madagascar. Most famous among those are the lemurs. Its teeming fertile forests and geographical isolation have served to preserve and propagate 'nature's design laboratory' in a mix found nowhere else on earth. 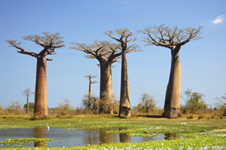 Madagascar's forests are a shimmering, seething mass of a trillion stems and dripping leaves. Nosy Tanikely (Little Land Island) is 10km west of Nosy Komba, an island south-east of Nosy Be. It is a protected marine reserve and therefore one of the better sites for diving and snorkeling. 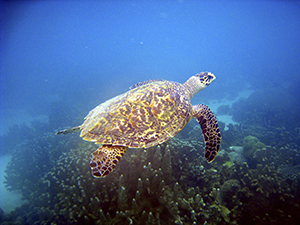 Expect stunning hard and soft corals, lobsters, eels, reef fish and occasional turtles. Other attractions include beaches, tide pools and a variety of tropical bird species. Nosy Komba (Island of lemurs) is a small volcanic island lying midway between Nosy Be and the mainland of Madagascar. The island offers several walking trails, and an excellent opportunity to observe lemur behavior, from the semi-tame black lemurs (small fee to clients, own cost). 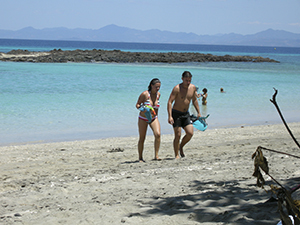 Visit local inland villages or head to the island's neighbouring islets for great snorkeling and swimming. small village up the hill to the old decommissioned lighthouse – designed by Gustav Eiffel& almst 100 years old. There are some stunning panoramic views from the top of the hill, where the old lighthouse keepers' house has been converted into a school. woods harbour abundant birdlife, reptiles and lemurs, and dolphins and turtles are often a common sight in the morning. This is the last remaining lowland rainforest on the island and is famed for its black lemur and beautiful nosy be panther chameleon. There is a wonderful beach, and further inland, some fresh water pools in the forest to explore. Sakatia Island is a tropical paradise. Situated near Nosy Be off the North Western coast of Madagascar, Sakatia is a true breakaway with no roads or motor vehicles, and only lots of foot paths, with which one can wander at leisure and explore the beauty of the island. It offers typically unspoilt tropical fauna and flora and has a population of only 300. The island is fringed by spectacular coral reefs to be enjoyed by the snorkeller or scuba diver alike. Only accessible by boat, the Nosy Mitsio Archipelago lies 70km north of Nosy Be. La Grand Mitsio is the largest of the 12 islands, and contains small farming villages. Nosy Ankarea is surrounded by coral reefs whilst Les Quatre Freres consists of four imposing silver basalt rocks, covered by hundreds of nesting seabirds. You are likely to encounter Manta rays in these waters. These islands are wild and unpredictable, and are seen as the crème de la crème for dedicated divers who wish to explore the numerous and varied sites. Both hard and soft corals are in good condition and the waters support a large diversity of reef fish. Moray Eels peek out from their crevices and large pelagics such as barracuda, kingfish and tuna are regularly sighted. a continental drop off with abundant Tuna, Barracuda, Sailfish, and Giant Kingfish.